This is one of Mahalo's 2011 "Art" range. This is a range of concept designs but at the usual Mahalo price. This one is quite different for the other in the set because it has the double "eyes" sound hole and isn't highly patterned, but I think it looks all the better for that. Then there is the rest of the series. 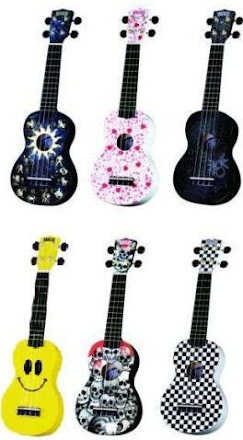 I guess its a similar idea to Kala's with the Ukedelic - I don't know who had it first though. The two hole and smile idea has certainly caught on now though, I have seen a number of other Chinese makers producing something similar; and in a variety of colours too. I have even seen Gold Tone has added one to their range!? I see Mahalo have tried to patent it, but I don't think it worked.